No need to reinvent the reel. 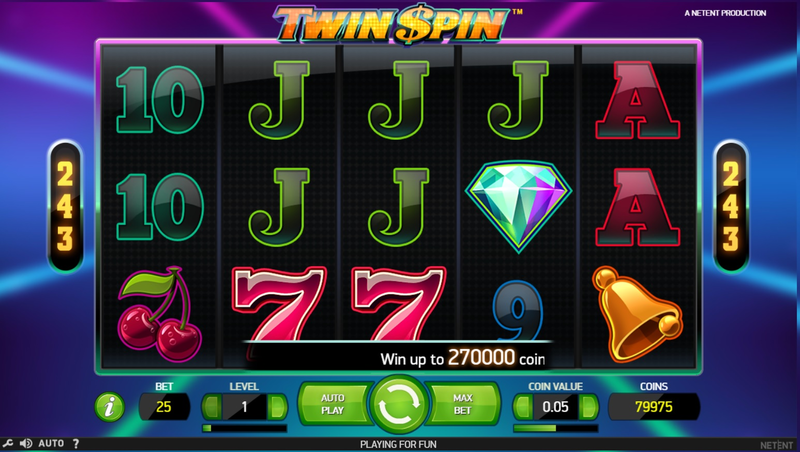 Twin Spin is a 243-way slot by Net Entertainment that doesn’t clutter your eyes with scatter or bonus symbols. Instead, you have a wild symbol and the namesake of their game: the twin spin feature. You’re in a hell of a ride with this one. Bright and colorful with a bit of a neon kind of look to it, Net Entertainment have a got themselves a 243-way slot on their hands. The real beauty of Twin Spin is that the interface is sleek and modern looking, lending itself for easy play. We opened it up, looked at the payout table and within seconds understood how this thing worked. Sometimes we just want to sit down after a long day and play a simple slot. Is that so bad? We don’t think so. If you nail the jackpot, you’re looking at some serious coinage. (Over 250,000, actually.) One thing to keep in mind is that there are no scatter or bonus symbols - just the wild symbol here which is obviously the diamond and substitutes all other symbols on the reel. All that out of the way, let’s cut to the chase: the bonus game here is unique and contributes to its popularity. Essentially, when you start playing, two reels that are next to each other will spin as one. They’ll stop and then you’ll get a set of symbols that match. The real excitement comes when more than two reels start spinning as one and start showing the same symbols. It’s at this point you’re in for a heck of a winning spin. It’s way simpler than we’re making it out to be - once you play a few spins you’ll get the jist and then you’ll be lost in the allure of this slot. With the unique Twin Spin feature, Net Entertainment has hit one out of the park. See, folks, sometimes you don’t have to reinvent the reel to make a great slot! Click here and start playing it.